After a nearly three-year wait, it’s finally here – Batman v Superman: Dawn of Justice, the launching-off point for the entire DC Extended Universe. With its two-and-a-half hour running time, myriad plot threads, and copious amounts of Easter eggs and cameo appearances, there are many and more scenes to pick from that sent chills down our spines and got us excited for future installments in the shared cinematic universe. Here, then, are our 10 Best Scenes in Batman v Superman: Dawn of Justice – be sure to share your own in the comments. It is clear that what director Zack Snyder and actor Jesse Eisenberg were going for with this newest incarnation of Lex Luthor was an electric, off-the-wall performance generally along the lines of Heath Ledger’s iconic turn as the Joker in The Dark Knight. While it’s open for debate just how successful the attempt was, Luthor is – at least writ small, in specific scenes – a mesmerizing presence, one that is able to simultaneously play innocent and creepy, aloof and intensely present. Perhaps the best scene to embody this dichotomy is when the billionaire CEO attempts to petition Senator Barrows (Dennis North) to grant him access to a litany of highly classified materials, starting with access to both General Zod’s (Michael Shannon) corpse and the crashed Kryptonian scout ship and ending with the importing of a large quantity of Kryptonite that’s been discovered in the Indian Ocean. It’s clear that Barrows is rather smitten with Luthor but also plainly intimated – such as when he allows the other to insert a Jolly Rancher into his mouth (“Come on – it’s cherry,” Lex says in his hard-to-read sing-song voice). That Luthor licks his fingers afterwards is both a declaration of dominance and a statement of his erratic, off-kilter personality – the perfect summation of his character. Although the relationship between Clark Kent (Henry Cavil) and Lois Lane (Amy Adams) is, in many ways, key to the character of Superman in the film – it is the method by which Luthor is able to deduce the Man of Steel’s identity, allowing him, in turn, to force the confrontation with the Dark Knight – there are precious few moments between just the two of them. This is why the bathtub scene, in which both characters attempt to deal with the aftermath of the situation-gone-sour in the Middle East, is so essential; it’s a quiet, tender moment between the two, in which the love Clark has for his Earthling girlfriend is laid quite simply bare. And there are, of course, lots of little extra flourishes around the exchange of dialogue. Clark brings home flowers and intends to cook dinner for the two of them, adding a much-needed bit of normalcy to the otherwise conflicted superpowered character. He wades directly into the bath tub, clothes and all, to add a little comfort to Lois – and bring a little sensuality to the screen. And, finally, in the scene’s closing shot, we see Clark’s glasses be put on the wet tiled floor, followed a moment later by an extra splash of water as the two embrace. It’s one of the simplest, but nicest, touches in the entire film. Comic fans have waited literally decades to see Diana Prince (Gal Gadot) suit up as Wonder Woman on the big screen, and Batman v Superman doesn’t disappoint in this regard, firmly placing the princess from Themyscira in the heated battle against Doomsday (Robin Atkin Downes). She is every bit the talented warrior that she is in the comics, arguably making her the most effective combatant against the Kryptonian monstrosity (though, obviously, it is Superman who ends up felling the beast), and the filmic debut of her iconic weapons – the Aegis of Athena (her bulletproof, shockwave-producing bracelets) and the Lariat of Hestia (perhaps better known in the popular culture as the Lasso of Truth) – is also appropriately effective. When not fighting as the immortal Wonder Woman, Diana Prince has much less screen time, but she is still a central part of the film’s basic plot – and its efforts in greater world-building. As Diana, she is able to lead men – even the smarter, shrewder ones, like Bruce Wayne (Ben Affleck) – around by their noses, blending seamlessly into nearly any societal setting. And in attempting to gain access to Luthor’s personal files, she becomes only one of a small few who become aware of the various meta-humans located around the country – as well as becoming one of the two founding members of the Justice League. 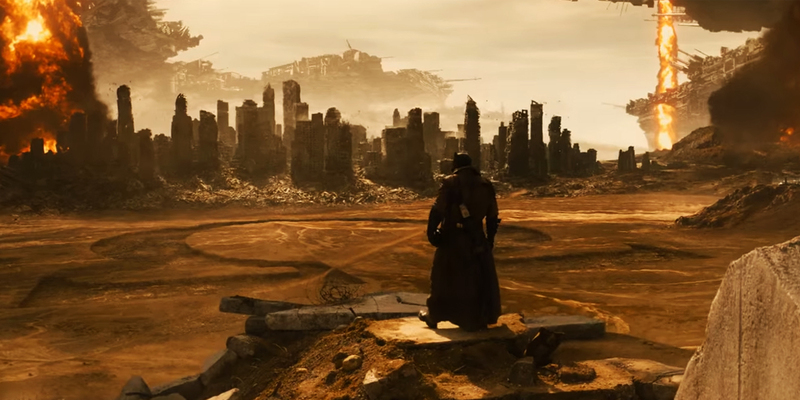 It is, at once, one of the most intriguing bits of foreshadowing seen in these burgeoning shared cinematic universes and also one of the most incongruous elements of BvS: while asleep and having the already-infamous “Knightmare” dream sequence (in which Superman and his alien overlords have managed to consolidate their rule in a post-apocalyptic world), Bruce Wayne experiences another vision – a time traveler wearing a superhero costume and spewing what initially appears to be random nonsense. Backed by the knowledge of the DC canon (and its current crop of television adaptations), comic fans know that this is none other than the Flash (Ezra Miller), who is using mastery of his superspeed in order to vibrate between dimensions and slip through the space-time continuum. He offers instructions to the mystified Bruce, telling him to seek out the various meta-humans and to keep close tabs on Lois Lane, since she is “the key.” It is doubtless that audiences will get to see the flip side of this scene – in which Barry Allen decides to hop back in time in order to give the younger Bruce Wayne instructions on how to proceed – in either 2017’s Justice League, Part I or 2019’s Part II, making the circle complete. What’s so interesting about this prospect, however, is the context it will appear in: is the Flash (and, presumably, the rest of the League) attempting to ensure that the timeline maintains its current path, or is he endeavoring to change its future trajectory? Lex Luthor is attempting to frame Superman, either to make an otherwise way-too-trusting public start to question their would-be savior or to make them directly turn against him. The coup de grâce in this regard is the luring of the Man of Tomorrow to the Capitol building, to have him defend himself in the very public forum against Senator June Finch (Holly Hunter), who attempts to call the alien visitor to task (and who has attempted to resist Luthor’s plans for the creation of a Kryptonian deterrent). What neither Finch nor Superman is aware of, of course, is just to what length the duplicitous Luthor will go in order to either neutralize his enemies or to advance his plans. It just so happens that the charade at the Capitol achieves both requirements: by detonating a bomb secretly planted in the wheelchair of Wallace Keefe (Scoot McNairy), a Wayne Enterprises employee who is injured during Man of Steel’s Battle of Metropolis, Luthor is able to kill everyone in the room, senators included, and once again paint the Man of Steel as a wanton, vengeful god who can’t be trusted. Imprisoned kids, a rookie, nervous cop, and a badly-beaten criminal – all are the ingredients to movie audience’s grand introduction to the third modern incarnation of the Batman. What strings all these elements together is the element of fear: the children refuse to come out of the makeshift cell they’ve been placed in, since “the devil” is still here – showing just how terrifying of a presence this more extreme, sadistic Batman really is; their would-be captor is beaten senseless and has been branded by having a Bat symbol seared into his flesh; and the terrified police officer, upon finally seeing Batman perched in the corner of the ceiling (just like his animal namesake) opens fire on the vigilante, attempting to level him with a well-placed shotgun blast. There is a bit of story logic that works to undermine the sequence – if the Dark Knight has truly been fighting crime for nearly the past 20 years, and if he has a Bat-signal placed atop the police department, why would the cop attempt to kill him, no matter how green he may be? – but it still serves as one of the character’s very best debuts on the big screen, perhaps only second to Michael Keaton’s famous introduction in 1989’s Batman. Batman v Superman pulls something of a Back to the Future, Part II, placing new characters and scenes in the midst of footage from the previous installment. In this case, it is Bruce Wayne flying and then driving into danger’s way as, first, Zod’s ship attempts to terraform Earth and then, second, the general battles Superman hand-to-hand in the streets of Metropolis – and, as we just now learn, in Gotham, the city across the bay. The fact that one of the more memorable moments from Man of Steel’s climatic fight – when Zod learns how to use his heat vision for the very first time, almost literally tearing the building around them to shreds – actually takes place in Wayne Enterprises headquarters is a nice touch, but the real drama here, of course, is in Bruce attempting to rescue all of his various employees from the crumbled wreckage of the building. Not only does the film firmly establish that Bruce Wayne doesn’t have to be decked out in his Batman costume in order to be a hero, it also serves to add a human element to the Battle of Metropolis – something that was sorely lacking in the first film. Never before has a Batman on the silver screen been a fluid, effective, action-star-worthy takedown machine, thanks to the limitations of the previous Bat-suits that the actors and stuntmen were forced to wear and to the limitations of filmmaking standards in previous decades. Ben Affleck’s Dark Knight, however, is a full-on fighting force, able to take on several opponents simultaneously and to dispatch them with the ease that a vigilante in his second decade of crime-fighting would be able to muster. It is as if viewers were watching the action-heavy videogame Batman: Arkham City being played out in real-life in front of them. Of course, never before have we had as vicious a Batman depicted on the big screen, as well; his brutal takedown turns fatal for a goodly number of his victims, as he breaks bones (and, one must presume, at least a few necks) and cuts enemy combatants down with their confiscated firearms. It’s already proven to be one of the most controversial elements of the new film – a situation which doesn’t seem set to change anytime soon. Still, the follow-up to the Kryptonian’s death, the public funeral of Superman in Metropolis and the private funeral of Clark Kent in Smallville, provides the emotion that the CG-filled action sequence can’t, partially thanks to the human element being involved – some of the cast’s best beats come in this sequence, from Diane Lane’s Martha Kent to Amy Adams’s Lois Lane – and partially thanks to the realization starting to sink into the audience that maybe, just maybe, the filmmakers are crazy enough to pull the trigger on Clark. It also doesn’t hurt that the intercutting of the two scenes is some of the smoothest, best-executed craftsmanship the entire movie has to offer. Forget all the countless explosions, the near-constant barrage of superpowered fisticuffs, the convoluted tapestry of various plot lines – when everything is said and done, the singular moment that manages to connect with audiences in the most personal and the most human way is Clark Kent’s climb to the top of a snowy mountain during his period of self-imposed exile. There, in his loneliness and in his need for guidance, he manifests an encounter with his deceased human father, Jonathan Kent (Kevin Costner), who is busy moving rocks to build – well, something. “I miss you, too, Dad,” Clark responds. Once again, it is these human moments that serve both the character and the overall film the most sure-footedly. Agree with our assessment? Think we missed an even better scene? Let us know in the comments. Need even more Dawn of Justice goodness? Check out the 12 Movies to Watch, the 10 Batman Comics to Read, and the 10 Superman Comics to Read before you see Batman v Superman.